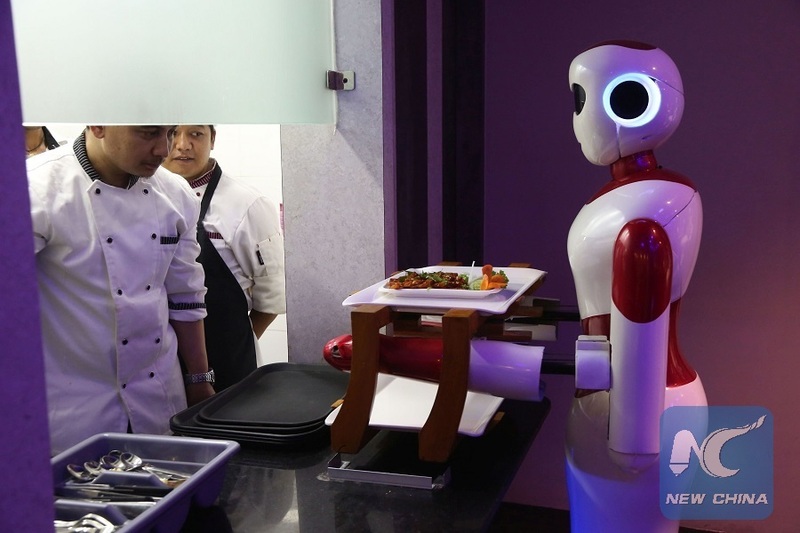 KATHMANDU, Aug. 25 (Xinhua) -- Amid many restaurants in King's Way, one of the most modern streets in Nepal's capital Kathmandu, a newly launched restaurant with robots as waiters has become the talk of the town lately. 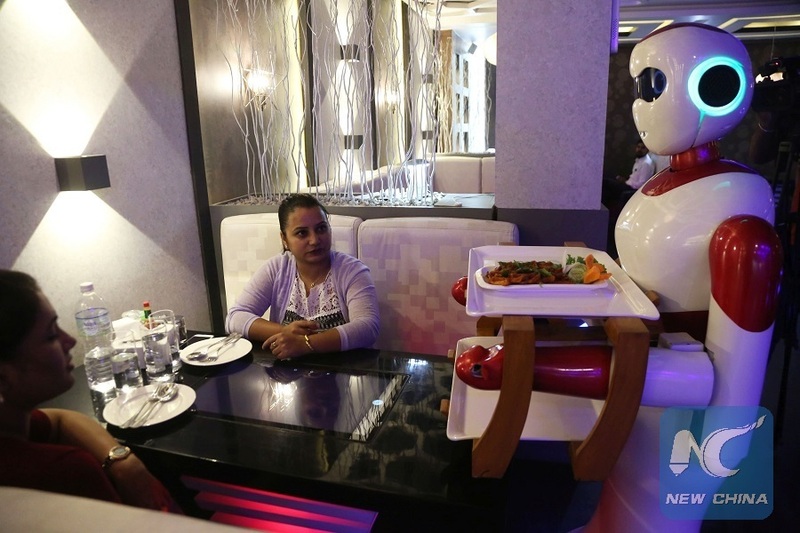 Under the slogan "Where food meets technology," the Naulo Restaurant (naulo means new in Nepali language) operates with the help of five robots, three named Ginger and two named Ferry, designed and manufactured by the Nepali hands. These robots are developed by Paaila Technology, a Nepali company established by six young engineers, specializing in robotics and artificial intelligence (AI) technology. The restaurant has menu implanted in digital screen in table from where orders can be placed directly in the kitchen. After dishes are ready, the robots collect them from the kitchen counter and serve the customers automatically. This is the first time in the Himalayan country that any restaurant has used "Made in Nepal" robots as service provider, with fully digital services filled with innovative technology. According to the company established in December 2016, these robots are up to the international standards and have high degree of superiority in the current market as a Nepali product. 27-year-old Raut, who completed engineering studies in India and Britain, said "we travelled to different countries including China and Japan to learn about the design, framework and operation of robots before launching it in Nepal. Now, our target is to introduce this Nepali innovation into international market." To start with, Paaila Technology has registered a company in China, and is currently working to penetrate into the Chinese market followed by global market. According to the young engineers, Nepali hand-made service robots are not limited to merely being a fancy attraction, but have industrial and commercial values due to innovative capabilities and quick operations. "Our service robots have more features as compared with other robots of the world while the manufacturing cost is cheaper. So, we are quite hopeful that we can compete with the international products very soon," 26-year-old Rabin Giri, co-founder of Paaila Technology, told Xinhua. Robot Ginger is powered with swarm intelligence, speech recognition, natural language processing, auto-dock ability, among others. The robot also cracks jokes while answers the basic IQ questions in both English and Nepali language. "Robots have not just replaced some manpower, but also have saved time," according to Giri, who completed electronics and communication engineering studies from Nepal's Pulchowk Engineering College. Paaila Technology entered the hospitality sector after the operation of its first humanoid robot named Pari stationed in a local branch of Nepal SBI Bank. Pari has been deployed in the digital branch of the bank known as inTouch branch, which functions as a source of information and guides customers. The first humanoid commercial robot started the work by greeting customer with "Good afternoon. Welcome to Nepal SBI InTouch." According to the bank officials, the robot received a good feedback from customers, due to which the bank was encouraged to use the second advanced robot manufactured by the same company within few months. Paaila Technology has spent around 15 million Nepali rupees (134,568 U.S. dollars) for research and development in last few years. Now, the members believe that the time has come to taste the fruits of hard work as they have been receiving demands from hospitality and banking sectors. "The service robots can bring a revolutionary change in the hospitality industry and commercial sectors. Thus, if we received positive feedback from the mass here at home, nothing can stop us to extend the reach of Nepali skill to the world," Raut said. For now, Naulo Restaurant is struggling to cater to the high flow of customers especially in the evenings and on weekends, as the robots have attracted people from all walks of life and of all age groups to experience the new technology. Sabita Bhandari, who was dining in the restaurant with a friend, told Xinhua that "I felt amazing to be served by robot instead of waiter. The robot is polite and friendly as well. It's a nice experience."